← We found our permanent home! 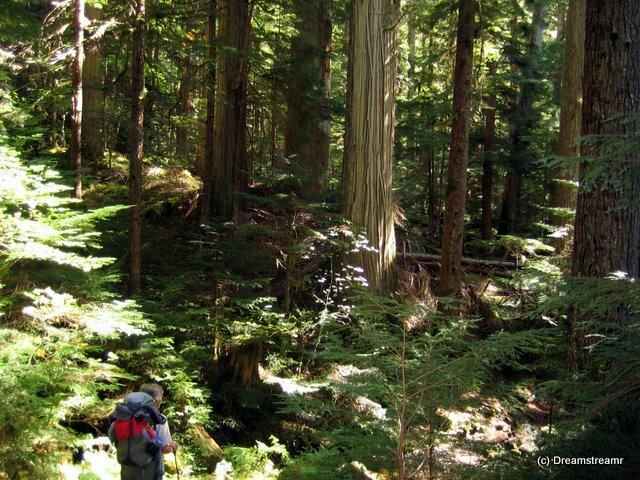 This entry was posted in Sightseeing and tagged backpacking, Cascades, cold beer, Colonial Creek, hot shower, McAllister Camp, Thunder Creek. Bookmark the permalink. Ahhhh, a hot shower, just not a long one!!! Excellent post!! We’re not much as hiking goes, but I would love to learn more. Our gear would have to have some major upgrades as well. I assume you used a grate for cooking over the fire. Even freeze dried food tastes great after a long day on the trail. I’m surprised and excited that you have also looked into a home base. Now just finding the right place, but guess one could always move it. ha! The discription on the home was great!. Do you know we have never run out of hot water in our Airstream? Not that 6 gallons is a lot of water, but the water is so hot we’re mixing it with a lot of cold. Plus we’re using an Oxygenics shower nozzle that apparently saves a bunch of water, so stretches our hot water. 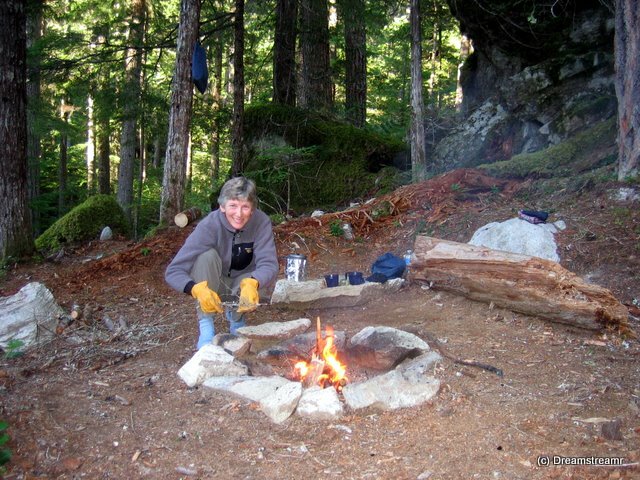 We have cooked over campfire when our stove failed us once, for a New Years dinner on the trail. It was decidedly the best trail dinner we’ve ever cooked because we could cook more than one dish at a time instead being constrained to one burner with a backpacking stove. Lately we have switched to a homemade stove burning alcohol. It is the lightest stove in our arsenal and, while not the hottest stove, the best for the weight. It worked just fine for boiling water for tea and for the freeze dried lasagna. You are absolutely right. Freeze dried is just fine after a few hours on the trail, and our Backpackers Pantry Lasagna was terrific. We followed it a while later, watching the fire, with a dark chocolate bar before we went to bed. It’s hard to beat a successful backpacking trip, and they’re almost always successful in some way. Some things don’t go right, invariably, but overall the trips are wonderful. The more you have to compensate for little hazards, the more memorable the trip. We came off the trail this time knowing Debbie’s pack wasn’t going to work. This was her first try with this new pack and it just didn’t do the job right. As soon as we hit Spokane we pulled the trailer into REI’s parking lot, right after opening time. REI was just great about taking the pack as a return. They guarantee everything 100% and did this one too. We had great help from Kit in the backpacks section and Debbie has a much better backpack, an REI Ridgeline 65. It weighs little (3#), holds more, and has far better suspension and pads. We’re going back soon. Somehow. Jim & Deb, A lot of variety & spice in your life! We want to hear how that 16′ house will travel down the road….It is easy to imagine your fun trying out the possibilities of where, when, & just what, while you live this present life!! We are on Site 27 at KHP where we met 2 years ago, maybe the same site. So it feels important to tell you how special a memory that is. A 3-week trip for us but not for George. Lots to do & learn & enjoy. Lots & lots of horses & pictures. Hope you’ll come to the Red Mile with us one day. We wondered about the 16 X 70 house making down the road, too. Our Airstream feels pretty wide at 8.5 feet and they call it a wide-body. We asked Vic, the rep at Heritage Homes and he said it was a super load and requires special transport permits and handling. A neat little article about super loads is at http://www.hiwidetransport.com/superloads.htm. Some locales are apparently not yet on the allowable destinations for I-house. Asheville, NC, is one of these. We guess it’s the difficulty of I-26 along Bat Cave and I-40 through the Smokies and over the Old Fort Mountain. We sure appreciate Kentucky Horse Park campground for realizing we needed to meet you and Dave, and acting on it by putting us in the adjacent site. You’ve enriched our lives and we feel so lucky. Just another of the great benefits of spending time RVing — we get to meet wonderful people in all kinds of places. We look fwd to hearing more about your three month trip.